Roth Audio OLi1 review | What Hi-Fi? Roth Audio may be best known for iPod docks, but it's about to upset the speaker establishment with this model. 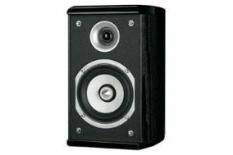 The Oli1 is the entry point into a three-strong stereo range and sets a terrific standard for the price point. Let's get one thing straight. These speakers are just 20 cm tall and therefore pack a tiny 10cm mid/bass unit, which means really deep bass is not even on the menu. This is not as bad as it sounds, though, as the lack of truly deep lows means the OLi1s can be placed close to a rear wall or even wall mounted and still avoid sounding boomy. This will suit some people down to the ground, and is a real advantage over top rivals like Tannoy's Mercury F1 Customs, which only sound comfortable away from a rear wall, sat upon a solid speaker stand. Positioned on something solid, and given some wall reinforcement these bookshelf-style speakers deliver a direct and communicative sound. They may be small, but that doesn't mean they sacrifice attitude. Listen to Radiohead's 15 Steps and these standmounts respond with enthusiasm. They're fast, punchy and astonishingly clear-sounding. Notes stop and start in an instant, and detail resolution is as good as we've heard at this price level. Shift musical gear to something like Mahler's10th Symphony and the Oli1s still impress. No, you don't get a great deal of scale, but you do get a decent dose of refinement, expansive stereo imaging and a very clear idea of what's going on in this complex piece. The latter, in particular, is something very few rivals can manage at this price point. Add pleasingly solid build and some neat styling touches, like black lacquer trim and a curved cabinet shape into the equation and the conclusion is clear: Tannoy and Q Acoustics have a worthy rival.